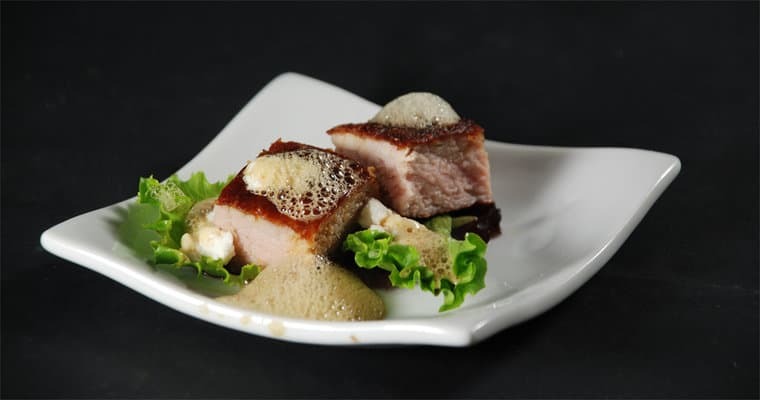 A good place to get started with molecular cooking is by using foams. 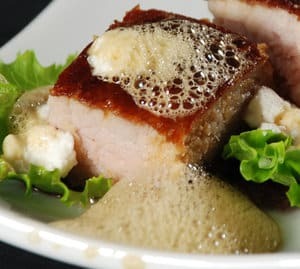 Many foams are easy to make and they add great flavor and texture to a dish. They can also be applied easily to many of your favorite meals. Here we will show you how to make a soy foam adapted from the excellent Alinea cookbook . Soy lecithin foams can be made from many liquids by adding between 0.2% and 1.0% soy lecithin by total weight to the liquid, heating it to a simmer, letting it cool, then blending it until it foams. 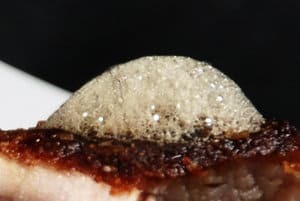 To make the soy foam we take equal parts soy sauce and water and whisk together with sugar and soy lecithin on the stove until it comes to a simmer. Strain it out and let it cool. Once you're ready to use it you just use an immersion blender on the liquid until it establishes a strong foam, about 2 to 3 minutes. You can then spoon the foam over your dish to serve. The basic soy foam ratio by weight is 100% water, 100% soy sauce, 4.8% sugar, and 0.8% soy lecithin. So basically you take equal parts water and soy sauce then add 4.8% (.048) of the weight in sugar and about 0.8% (.008) in soy lecithin. For example, take 100 grams of water and 100 grams soy sauce then add 4.8 grams soy sauce (100 * 0.048) and 0.8 grams soy lecithin (100 * 0.008). Combine all of the ingredients in a sauce pan. Bring to a simmer while whisking occasionally to break up any lumps. Strain through a chinois into a wide, flat bottomed, container. You can set the soy sauce mixture aside like this for several hours. When ready to serve, blend the soy sauce mixture using an immersion blender until a nice head of foam develops. Let the soy foam sit for 1 minute to stabilize and then spoon it out onto your dish.